Everyday around 8:30, I look in the windows and make sure that no one was in the house that I didn’t know about. Sometimes the homeowner doesn’t leave at all, and I’m stuck outside; but if she does leave, she always returns at exactly 6:30 in the evening. 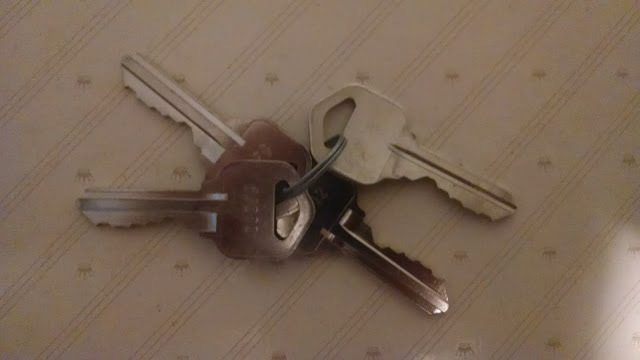 The first time I discovered this house, she had accidentally left it unlocked, but then I found a spare key in her desk. I had an extra one made and have been using it every day since. I don’t ever steal anything valuable. The first thing I do is take a nice warm shower. That way, the water heater has time to compensate by the time she gets back home. She keeps a lot of fruit in her kitchen, so I pick and choose what won’t be noticed. I also like to have a piece of toast, careful to clean up the crumbs. Since she doesn’t own a television, I spend the rest of the day reading the books she has in her library. After a couple years of this, I had all of the narrative fiction read; some of them twice. I moved on to the more technical material that would have been far beyond me before. She was apparently some kind of astrophysicist. I was this close to finishing high school, but I’ve learned more in the last few years of reading on my own than I ever did as a kid. I found her educational literature to be fascinating, and wished that I had had an opportunity to go to college. After exhausting her resources, I started to check books out of the public library, but I would always read them in her house. It felt more like home to me, even though I could never sleep there. One day, I was in the middle of a book about exoplanets, when the door opened. The homeowner walked in and dropped a stack of papers on the coffee table. I’m stunned. “Applications for your GED, college admittance, and financial aid,” she said. “I think it’s time we move you on to a formal education.” How long has she known?